Choosing the perfect edge for your countertops is easier than you think! After all the effort of picking out the perfect product for your countertop to be made of, now it’s time to consider another aesthetic, the edge. The edge profile of your countertop can do a lot to add grace, elegance or functionality to your counter and there are a lot of options for how these can look. Straight edges provide a nice classic design and are great in any kitchen. If the aesthetic you’re going for is cool and clean, a straight edge might be the right choice for you. A straight edge design is less likely the steal attention away from the granite you chose for your counter tops and can provide cohesion for the rest of room. There are a variety of straight edge designs to choose from: bevel, extended bevel, straight with and apron, and radius. All these designs have something a little different about each of them that can keep your kitchen countertop looking unique. Straight edges aren’t sharp and shouldn’t be a safety concern since the edges are rounded just enough to protect yourself and the granite. 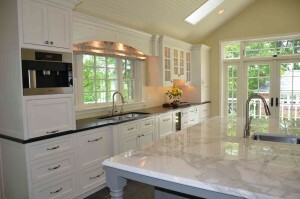 Curved edges can be basic or on the fancier side for the more upscale kitchen. They often soften the feel of the room and can work within contemporary design parameters well. If you’re considering safety as a factor for young children, curved edges are arguably safer than a straight edge. There are quite a few curved designs to choose from, some of which are: Pencil, Demi Bullnose, Tuscan Curve and O’gee. Each of these designs is unique and could add a quality to your room. Consider your cabinets and select the best design to match the architecture of the room. If you want your countertops to really make a statement, highly designed countertops might draw the attention you’re looking for. While most contractors are willing to help you design and edge all yourself, there are some common fancy edges to choose from. Versailles, Chiseled, Roman Ovollo are just three classics. Keep in mind these edges are typically used for kitchen islands and if over-used they can overwhelm your space. This entry was posted on Friday, May 5th, 2017 at 12:50 pm. Both comments and pings are currently closed.